Art from the Bronze age (c.3000-1100 BCE), an important period linking the Stone Age with the Iron Age, was a reflection of the environment of the time. The Bronze Age was characterized by the production of the metal bronze (an alloy of copper and tin), the development of a wide range of functional and precious metalwork, and an increase in economic productivity and the consequent emergence of skilled workers, many of whom were involved in artistic activity, albeit of a semi-functional nature. Ornamental and decorative designs on helmets, body armour, swords, axe-heads and other weapons became more widespread. Ceramic designs became more elegant, and a new range of ceremonial/religious artifacts and artworks began to emerge. Also, late prehistoric sculpture blossomed, taking full advantage of bronze casting methods. decorative arts, see: Ancient Art. The best examples of Bronze Age art appeared in the 'cradle of civilization' around the Mediterranean in the Near East, during the rise of Mesopotamia (present-day Iraq). For details, see: Mesopotamian art (c.4500-539 BCE) and Mesopotamian Sculpture (c.3000-500 BCE). For the earliest art forms in Mesopotamia, see: Sumerian Art (c.4500-2270 BCE). Egyptian art was also established during the Bronze Age, in the form of monumental architecture - notably the Egyptian Pyramids - and also included a range of murals, pottery and sculpture. 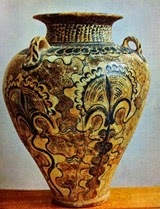 Persian art was equally advanced, while Aegean art in the form of the Cycladic, Minoan and Mycenean cultures also emerged during this time, as did Assyrian art (c.1500-612 BCE) and Hittite art (c.1600-1180 BCE). Within a few centuries Greek art proper would appear, along with Etruscan and later Roman art. In several of these regions, the emergence of cities, the use of written language and the development of more sophisticated stone and metal working, made it possible to increase the type and quality of art produced. In the Far East, Neolithic Art in China (7500-2000 BCE), was followed by Xia Dynasty culture (c.2100-1600), Shang Dynasty art (1600-1050) and Zhou Dynasty Art (1050-221) all of which became famous for their bronzes - see also: Traditional Chinese Art: Characteristics. 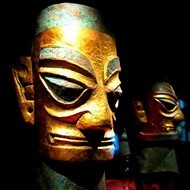 For more dates in the early history of East Asian culture, see Chinese Art Timeline (18,000 BCE to present). Examples of Bronze Age art within the Mediterranean area include: a wide range of painted ceramics, fresco murals, including landscapes as well as figurative pictures of humans and animals. Religious relief and free-standing sculpture, mostly carved from stone, although wood carving was also common. There were paintings of Gods, and a range of artistic tributes to Kings and secular rulers were also seen. A particularly rare Bronze Age statue is the Palaikastro Kouros (1480-1425 BCE), a chryselephantine sculpture carved from a hippopotamus tooth, found on the island of Crete. During this period, art began to assume a significant role in reflecting the community, its rulers and its relationship with the deities it worshipped. Bronze Age art in Europe is exemplified by megalithic art, like engravings and other petroglyphs, at Newgrange Megalithic Tomb (c.3300 BCE), the larger Knowth Megalithic Tomb (c.2500 BCE) and the Stonehenge stone circle (c.2600 BCE). As the Bronze Age came to an end around 1100 BCE, the history of art reveals a widening cultural gap between Northern and Mediterranean Europe. Climate, the presence of minerals and other precious metals, security, social cohesion and trade were all factors which favoured faster economic development, which in turn led to a faster growth of the arts (especially painting and metalwork) in the regions of the South, and along the principal European waterways like the Rhine and the Danube.  For more ancient artworks, see: Homepage.